There is an invisible, spiritual war going on all around us. The warfare centers in deception and in idolatry. The NEW Idolatry. God commanded, “thou shalt have no other God but Me.” Yet from generation to generation, idolatry has captivated mankind. For centuries, devils and demons have disguised themselves as gods as they spread occult and magical knowledge. God mocked the fake gods with the 10 plagues that fell on Egypt. The gods of Egypt had different names in the days of Moses, but they are the same gods who are deceiving us today. These gods are fallen angels: devils and demons. Devils and demons have developed a much more clever deception for our generation. The Almighty is still mocking the Gods of Egypt. From prosperity preaching, to casting out of demons and deliverance ministry, to false prophecies, healings and miracles of charismatic witchcraft, to alien encounters, God mocks the power and authority of religious fallen angels today. With every false doctrine and demonic practice, Christians are opening themselves up to demons. The fallen angel, the fake Jesus known as Jesus Sananda Immanuel— Sananda is now the god of the organized church. No one is immune from Sananda’s deception. Every discerning Christian needs this book in order to get ready, be ready and stay ready for the final days. Deception is knocking at your door. 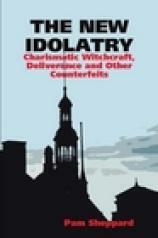 The New Idolatry will prepare you to shut the door and keep it LOCKED. For deliverance counseling, coaching, mentoring or training, call 518-477-5759.